With Restaurant Week going on, there were several other restaurants that were having special deals. One of these happened to be London Grill. 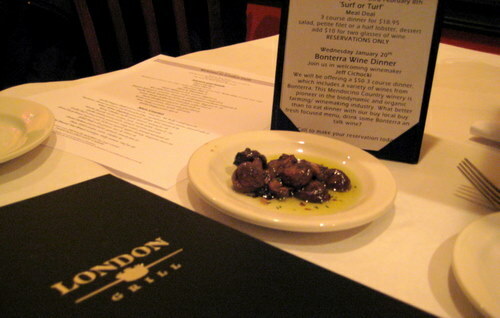 To thank frequent diners, they offered a special $18.95 Meal Deal of fresh maine lobster or filet of beef. This seemed like such a deal! Lobster or Filet for $18.95? Well, it didn’t quite live up to what they made it out to be. I had gotten an email announcing the deal and it promised fresh maine lobster or filet of beef. When we got there, the little menu card now said fresh maine half lobster or filet of beef. That was fallacy number one. Well fine, we decided to go for it anyway. It mentioned nothing about how it was prepared, but we envisioned half a lobster sitting on a plate with some veggies. Well, first we got some complimentary mushrooms and bread. For someone who’s not that into mushrooms, these were surprisingly tasty! 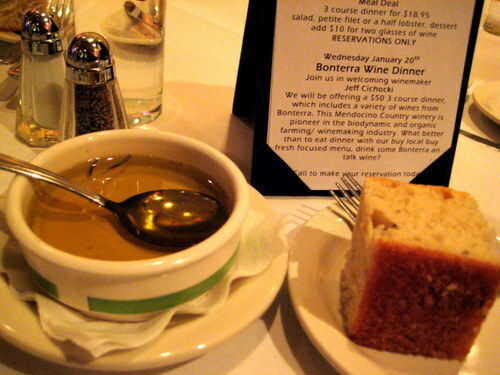 And the bread was a focaccia, also tasty. 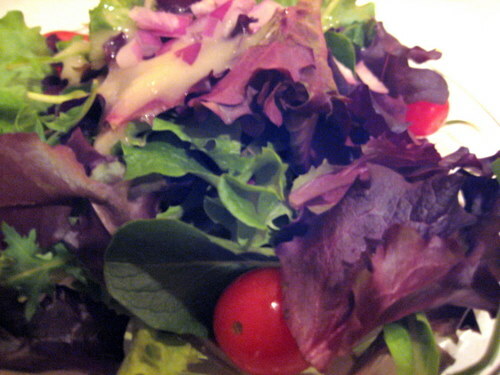 We got a house salad, which was just fine. No choice of dressing or anything, you just get what they give you. R wanted a caesar salad and they brought her out a caesar one, without any additional charge. That was pretty cool of them. 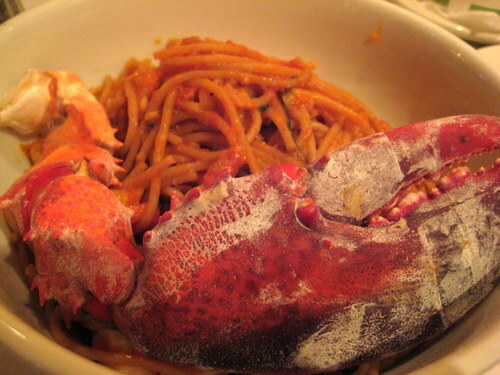 When we got the fresh maine half lobster, we actually got a bowl with whole wheat spaghetti, topped with a lobster claw, with some additional lobster meat thrown into it. Not at all what we expected. It tasted fine, but we didn’t expect a spaghetti dinner. We expected a lobster dinner. The spaghetti was also extremely garlicky and slightly spicy, which I didn’t mind, but others may. I don’t know about you, but when I envision lobster dinner, a bowl of spaghetti ain’t it. 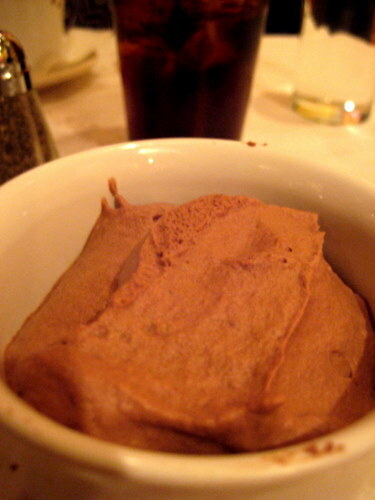 For dessert, it was chocolate mousse. For someone who’s not all that into chocolate or mousse, I still liked this a lot. So kudos on the chocolate mousse. But no kudos for the fact that I came here to get a particular drink and they didn’t have the beer it that was required to make it. If you put a drink on the menu, then make sure you have all the components with which to make it. 99% of the reasons I even went to London Grill was to get this drink, and they didn’t even have it. Fallacy number 2. The service… oh, the service. Our server tried, she really did, but she just wasn’t very good. She wasn’t good at explaining, she wasn’t good at imparting information, she just wasn’t very good at being a server. I suggest she look into another line of work. At the end of the day, the meal was fine, and for getting three courses, it is a deal, but it’s not one that I could recommend. They don’t quite tell you what the deal is, and that’s how they sucker you in. They promise lobster and give you mostly lobster bits. So I’m going to have to say skip it!